I'm happy you are here. If you are wondering if or how I can help you with a particular problem or situation, send me an email and I'll do my best to get back to you within 24 hours. I offer many services to help you heal the core issues that that block you from all that you want. 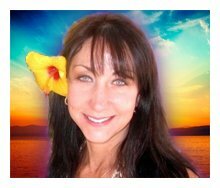 I have been studying health, healing and anything metaphysical for over 20 years, and have devoted a vast amount of my time learning natural health and healing techniques to promote a healthy mind, body & spirit. At one point during my search, I decided that I needed to put everything that has worked for me and my clients into one step-by-step process that can be followed on a daily basis. Hence... The Secret Formula was born. Coming from an IT background, I have extensive troubleshooting experience. I find people much more interesting than computers, however, so I quit my day job and now do what I love. I've studied many modalities and use them to troubleshoot and heal the lives of my clients. After studying, using and testing many different modalities, the ones I use the most are Matrix Energetics, Reconnective Healing and EFT. Combined with the ability to obtain patterns and information psychically, I can work with you to heal the issues from your past that are creating "problems" in your present situations, helping you to transform your life for the better. Reconnective Healing® and The Reconnection™ are practiced by allowing a higher intelligence to work through me, creating healing in my clients. Learning, practicing and experiencing the work of Matrix Energetics has awakened my intuitive abilities which were further developed during my psychic development training. Providing you with an outside insight can help you clear up the things that block you from the abundant health, wealth and happiness that you deserve! Make your appointment today to experience these frequencies first hand! Or simply email me. I'd love to hear from you and what your affliction is... whether it's physical, emotional, mental or spiritual. 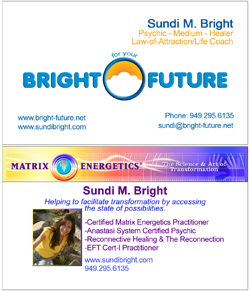 Feel free to either email me at sundi@bright-future.net or call me at 949-295-6135.